Analyzing Social Media Networks with NodeXL offers backgrounds in information studies, computer science, and sociology. 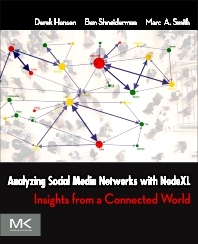 This book is divided into three parts: analyzing social media, NodeXL tutorial, and social-media network analysis case studies. Part I provides background in the history and concepts of social media and social networks. Also included here is social network analysis, which flows from measuring, to mapping, and modeling collections of connections. The next part focuses on the detailed operation of the free and open-source NodeXL extension of Microsoft Excel, which is used in all exercises throughout this book. In the final part, each chapter presents one form of social media, such as e-mail, Twitter, Facebook, Flickr, and Youtube. In addition, there are descriptions of each system, the nature of networks when people interact, and types of analysis for identifying people, documents, groups, and events. 10. Twitter: Conversation, Entertainment, and Information, All in One Network! Derek L. Hansen is an associate professor in the Information Technology program at Brigham Young University. Prior to that he was at the University of Maryland’s iSchool where he directed the Center for the Advanced Study of Communities and Information and was a member of the Human Computer Interaction Lab. Dr. Hansen completed his PhD from the University of Michigan’s School of Information where he was an NSF-funded interdisciplinary STIET Fellow focused on understanding and designing effective online socio-technical systems. Dr. Hansen’s research and teaching focuses on understanding and designing social technologies, tools, and games for the public good. He has received over $2 million in grants (as a PI or co-PI) to help develop and test novel technical interventions with interdisciplinary collaborators including educational Alternate Reality Games (AGOG, DUST, The Tessera), Playable Case Studies (Microcore), Citizen Science games (Floracaching, Odd Leaf Out), and exercise games (Fitplay Games, various pervasive play games). He has also worked with the Social Media Research Foundation and Human Computer Interaction Lab (HCIL) to develop and evaluate NodeXL, a free network analysis and visualization tool that runs in Microsoft Excel and is designed to help community analysts make sense of the mass of data available via social media tools such as Twitter, Facebook, and email. Ben Shneiderman is a professor in the Department of Computer Science and founding director of the Human-Computer Interaction Laboratory at the University of Maryland. He was elected as a Fellow of the Association for Computing (ACM) in 1997, a Fellow of the American Association for the Advancement of Science (AAAS) in 2001, and a Fellow of the National Academy of Inventors (NAI) in 2015. He is a past recipient of the ACM SIGCHI Lifetime Achievement Award. Dr. Shneiderman is the author and coauthor of many books, technical papers, and textbooks. Marc Smith is a sociologist specializing in the social organization of online communities and computer mediated interaction. He founded and managed the Community Technologies Group at Microsoft Research in Redmond, Washington and led the development of social media reporting and analysis tools for Telligent Systems. Smith leads the Connected Action consulting group and lives and works in Silicon Valley, California. He is a co-founder of the Social Media Research Foundation which is dedicated to Open Tools, Open Data, and Open Scholarship related to social media. Smith’s research focuses on computer-mediated collective action: the ways group dynamics change when they take place in and through social cyberspaces. Smith’s goal is to visualize these social cyberspaces, mapping and measuring their structure, dynamics and life cycles. At Microsoft, he developed the “Netscan” web application and data mining engine that allows researchers studying Usenet newsgroups and related repositories of threaded conversations to get reports on the rates of posting, posters, crossposting, thread length and frequency distributions of activity. Smith applied this work to the development of a generalized community analysis platform for Telligent, providing a web based system for groups of all sizes to discuss and publish their material to the web and analyze the emergent trends that result. Dr. Smith is an adjunct faculty at the College of Information Studies at the University of Maryland and a Distinguished Visiting Scholar at the Media-X Program at Stanford University.